Ever since they were formed in 2012, K-pop boy band BTS has stolen the hearts of millions of people around the world. We mean, with their catchy songs, angelic voices, to-die-for looks and swoon-worthy dance moves, it’s pretty hard not to become obsessed with them. They’re pretty much all anyone talks about these days. But for those of you that aren’t huge BTS fans, you may have a lot of questions. Like, where did this band come from? What’s so good about them? Who are the members and how do you tell them apart? Well guys, we’ve got you covered. We went ahead and rounded up everything you need to know about the iconic band, so if you haven’t already, prepare to fall madly in love with them. Plus, we’ve even got an exclusive message from each member! SCREAMING. From the members to their rise to fame to everything they’ve accomplished, scroll through our gallery for a full breakdown on K-pop band BTS. When did BTS form and how? The group was formed back in 2012 through an audition process with Big Hit Entertainment — a Korean record label. They made their music debut in 2013 with their album 2 Cool 4 Skool. But in 2017, the band announced that they were changing their American name to “Beyond the Scene.” So basically, in Korea they’re still known as Bangtan Songyeondan, but because they felt the name of their band was being lost in translation, they’re now known as “Beyond the Scene” in America. It’s super simple, actually! K-pop stands for Korean pop — which is literally pop music originating from Korea. How many albums has BTS released so far? The band has released a ton of music over the last six years. They’ve dropped four Korean albums, five Japanese albums and five EPs. Plus, their new EP Map of the Soul: Persona is hitting stands on April 12, 2019! And that’s not all — they’ve also embarked on five world tours and released two movies! Wow. Have they broken any records? BTS has broken a lot of records over the years. Their latest LP, Love Yourself: Tear, debuted at number one on the Billboard Album 200 chart, and in doing so it made them the first Korean artist to reach the top spot. Plus, the album broke the record for the highest number of pre-orders for a Korean album when it sold 1,449,287 records before it’s release. Legends! BTS also became the first Korean group to ever top the iTunes Top Songs chart in the United States when their remix of “MIC Drop” reached the number one spot. And that’s only a few of them — the list seriously goes on and on! You can check out some more records they’ve broken here. How long will BTS be around for? You can all breathe a sigh of relief because the band isn’t splitting up any time soon. The boys re-signed their contract with Big Hit Entertainment near the end of 2018, and did we mention it’s for another seven years? That means we’ll at least be getting new music from the guys through 2026. Phew! Almost every fanbase has a name (like Swifties, Directioners and Beliebers for example! ), and the same goes for BTS. Their fandom is called ARMY, which stands for Adorable Representative MC for Youth. Where can I follow them on social media? You can follow the band on Instagram here. As for Twitter, you can check out their American account here and their Korean account here. Which celebrities are fans of BTS? If you’re a fan of BTS, you aren’t alone! A ton of our favorite celebrities have also joined ARMY. 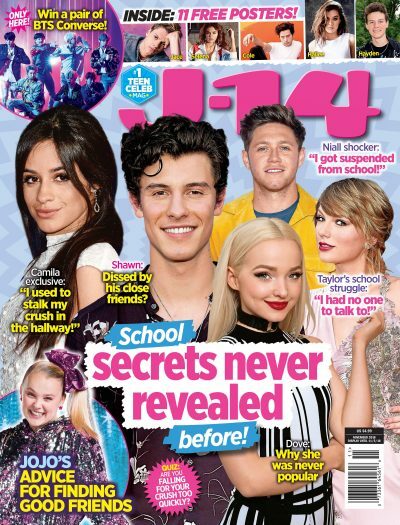 Stars like Charlie Puth, Ed Sheeran, Ross Butler, Shawn Mendes, Liam Payne, Camila Cabello, Laura Marano and more have admitted they too are obsessed with BTS. How many members does BTS have and what are their names? The boy band has seven members who have all been singing their hearts out and showing off their epic dance moves since the beginning. Their names are Jungkook, Jimin, V, Suga, Jin, J-Hope and Rap Monster. Keep scrolling to find out all the deets on them all (and to see a special message from each member!). Pets: I don’t have any!